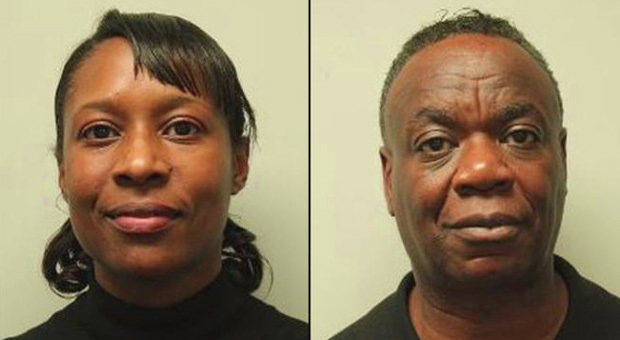 Two heavily-armed CDC officials who were arrested by police have confessed to being part of a "secret mission" to leak a "deadly virus" to spread in the United States. 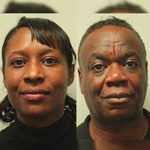 59-year-old Francho Bradley and his wife Adrianne Dershunit Jennings, 40, were apprehended by Tewksbury Police on March 25 after a tip-off triggered a police search of their Residence Inn hotel room. Officers arrived at the hotel to find a massive weapons and equipment cache which included a number of heavy machine guns, silencers, ammunition, smoke grenades, flash bangs, explosives, a rocket launcher, cellular phones and even satellite phones. Following interrogations from investigators, Bradley, who also has DoD clearance and worked on Obama's presidential campaign, admitted to being part of a CDC plot to launch a biological attack on American citizens by spreading a deadly virus. 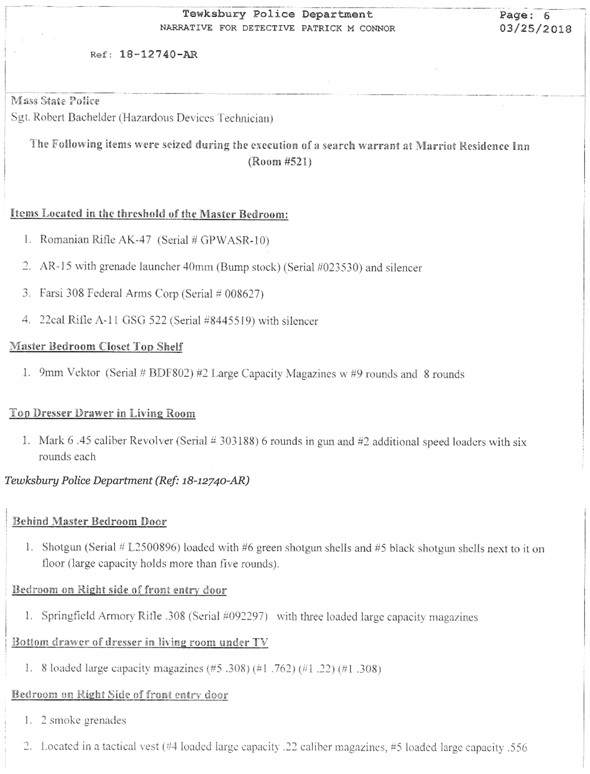 According to Intellihub, the massive weapons and equipment cache was discovered by officers who made entry into room #521 using a cleaning services room key around 4 p.m. after Bradley called 9-1-1 and claimed that his room which he admitted contained a firearm may have been broken into after he noticed his remote camera feed (much like Stephen Paddock’s) cut out while he was out and about. However, what the three officers and a detective found when they forced entry into room #521 was alarming, to say the least. 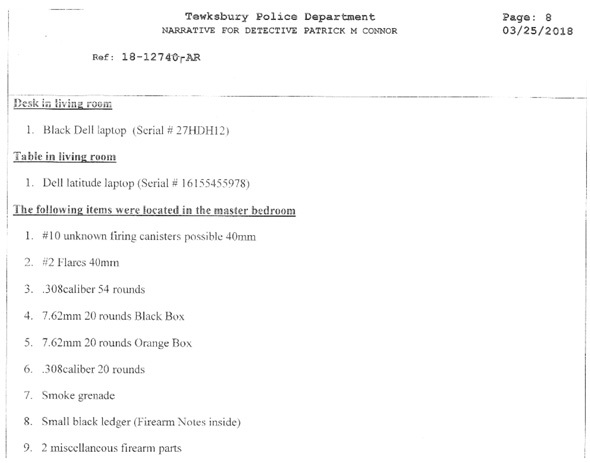 “Upon entry, we cleared the hotel room for possible suspects [but] did not locate anyone inside but we did observe what appeared to be a large duffel bag with several long guns sticking out of it,” Detective Patrick M. Connor stated in a police report (Ref: 18-12740-AR) filed later that day in which Officer Connor states that he also observed a fully loaded handgun which contained 6 rounds. Sgt. Columbus who was present at the hotel phoned Bradley to ask if he would give his consent for police to search the room while Bradley was still on his way back from Route 495. According to the report, Bradley agreed to the search and continued to head that way. When Det. Patrick Connor attempted to remove the firearms from what appeared to be a duffel bag a closer inspection revealed the bag was not a bag at all and rather a green flight suit. 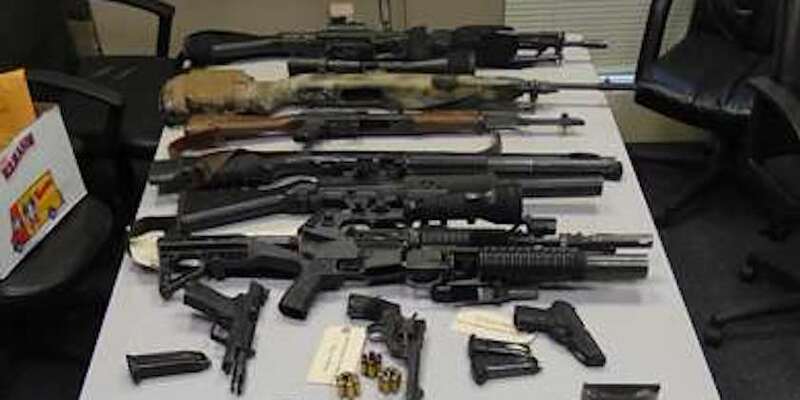 One of the three firearms had a detached stock and a silencer while another “appeared to be an AR-15 style rifle with a grenade launcher affixed to the bottom” of it. A number of fully-loaded magazines were found in a dresser drawer nearby along with a third rifle that was brown in color. “In the bedroom located on the right side of the hotel room we located a gun case with a larger capacity camouflage-colored rifle with a scope [and] three loaded high capacity feeding devices that matched the rifle,” Connor reported. Additionally, one of the rifles recovered was outfitted with a bump stock (much like Stephen Paddock’s weaponry) which is illegal in Massachusetts. Once all of the firearms were secure the officers awaited Bradley’s arrival. When Bradley finally appeared on the hotel property in his white Jeep (TX Reg. 11JY6164) he exited the vehicle in the parking lot and gestured to the officers who were already on the scene. Out of an abundance of caution, the officers placed Bradley in handcuffs in order to further evaluate the situation. Soon after, Bradley was read his Miranda Rights and freely consented to speak with the officers on scene. The detainee then provided Officer Connor with a Texas identification card upon his request (ID 03328980) along with a valid (confirmed through a local Fusion Center) Texas License to carry a handgun (TX03328980) with the expiration date of February 8, 2022. 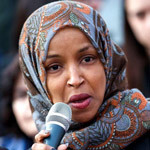 However, to the detainee’s regret, a Texas License to carry is not reciprocal in the State of Massachusetts which means that Bradley was “deemed unlicensed,” according to the report. “We confirmed with Francho that he wasn’t carrying these firearms under any special circumstances as well as he didn’t have any military I.D. 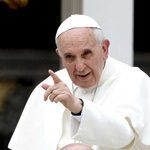 or police cards,” Detective Patrick Connor stated in the report. He also stated that we could take the guns and store them at Tewksbury Police Department, but he would have to come get them if he was called for his mission. Francho went on to say that he can’t tell us what he does, [where he] works, or why he has all the guns with him but [said] that he is down in the area working for a government agency that is dealing with a virus. I asked Francho what agency he works for but he stated that he couldn’t tell us and [said] that if we found out what he was doing we would have to be writing reports for a long time, due to the fact that it is classified. Francho came off very odd, it appeared that he was trying to hide something and was not forthcoming at all. Although, Francho was cooperative and provided answers to all of my questions he kept advising me that he couldn’t tell us why he was here or why he possessed all the firearms because it was classified. Francho kept telling me he worked for the LA Police Department but later told me it was only for five years. We contacted LAPD but they told us to call back Monday for confirmation. Sgt. Farnum and McLaughlin arrived on scene to assist. 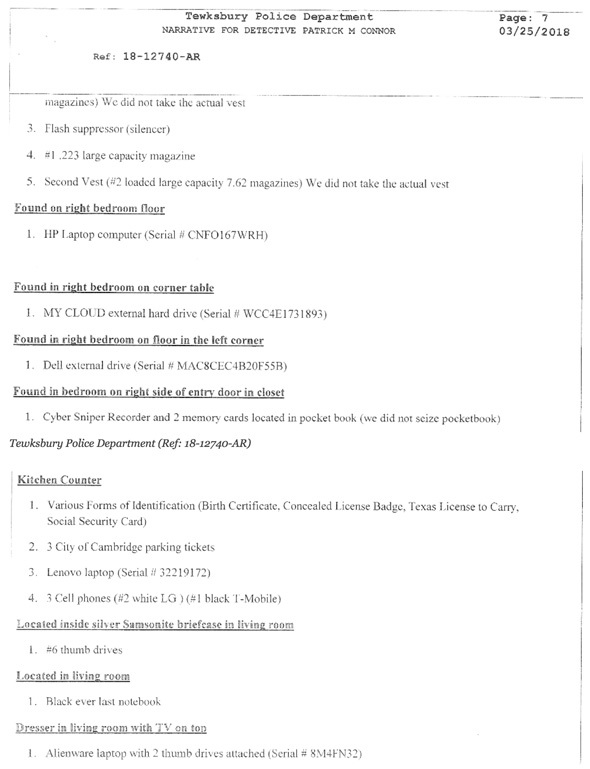 Soon after, Bradley confirmed he rented room #521 under his name March 11th through March 24th and gave officers consent to search the room which allowed Detective Connor to find three parking tickets from Cambridge Street at Anthem Street and Second Street. “Two of the tickets were at the same exact location two days apart and the third was from an area a short distance away on a third day,” the detective reported. Bradley’s statements continued to fuel the detective’s suspicions that Bradley may have been out surveilling the area. Not to mention, Detective Connor observed several military-style tactical helmets, along with several tactical vests that were equipped with flashbangs and smoke grenades. Military style electronic equipment and satellite phones were also present as well as a 40mm grenade launcher. The detainee eventually broke down and told Sgt. Farnum that he was a contractor for a company he owned named Enzyme Engineering. Although, he would not go into detail about what the company did. Additionally, officers could see what appeared to be a laptop inside Bradley’s white Jeep that was mounted on a stand near the center console, similar to the ones police use. The laptop was open and powered on and a hot spot was also visible. About that time, Francho’s wife, Adrianne Jennings, was read her Maranda Rights from a preprinted card, the same as her husband was moments before. Jennings told officers upon being questioned that the two always carry guns with them just in case her husband gets “deployed” but didn’t elaborate. A search of room #521 revealed Jennings was staying in the room with Francho after it became apparent some of her possessions were inside. Moments later, officers discovered that Jennings did not have a license to carry firearms. As Francho was being placed under arrest on various firearms-related charges police located and seized two flash drives from his person and a blue T-Mobile Galaxy S3 smartphone. “Shortly after, Adrianne was advised she was under arrest and a walkie-talkie similar to the one observed on the counter of the hotel room was located in her purse incident to arrest,” the report states. 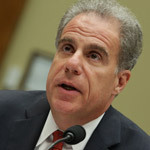 According to Officer Connor’s report, FBI Senior Special Agent C. Brackett, and Special Agent S. McGawnn, along with Sgt. K. Ferrazzani of the Massachusetts State Police (Joint Terrorism Task Force) arrived at TPD to conduct an interview of Francho where he made comments to agents that appeared to be detached from reality but may have very well been true, as there was simply no way for anyone to verify some of Bradley’s claims. During the investigation process, that day, officers contacted Texas PD where Francho and Adrianne live to ask if there were any reports on the Texas couple. As it turns out, Francho called the police on 19 March and advised them that Adrianne “went missing” and told police that she had “mental issues which she took medication for” but Adrianne told a rather different story. Francho and Adrianna were both booked on 45 firearms charges and data from Francho’s Galaxy S3 smartphones was authorized for extraction. Thanks to @Montograph on Twitter, and the extraordinary research he’s done regarding Bradley himself, we can now see that Ensyma Engineering Limited is a U.S. company based out of Coppell, Texas, 820 South Macarthur Boulevard # 105, to be exact which is the location of a UPS store that’s being used as a proxy location of business. 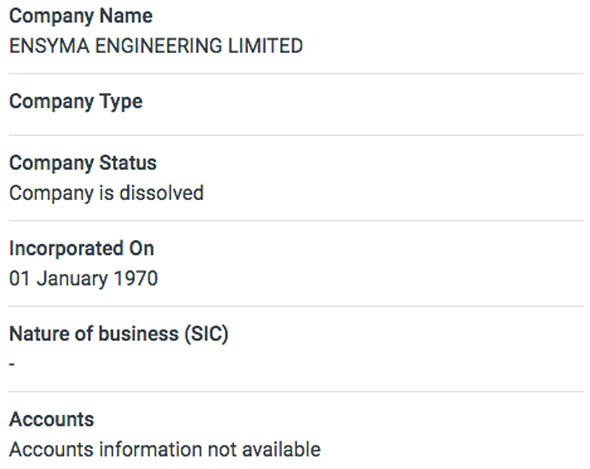 Nonetheless, Montograph also uncovered the fact that Francho Samuel Bradley also owned a company named Ensyma Engineering Limited that was incorporated in the United Kingdom on the first day of January back in 1970 and was appointed a director of the company on 9 Oct. 1991, along with a man by the name of Robert Harvey but the company has since been dissolved. 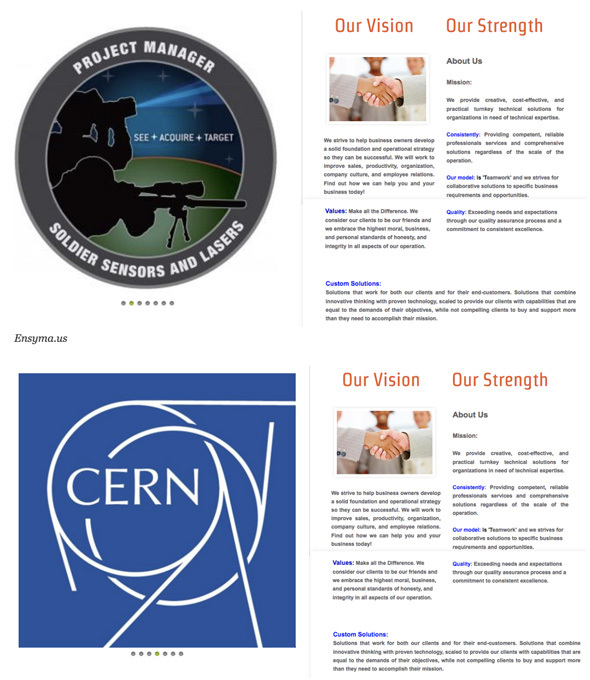 A screenshot was taken from the Internet Archive that reveals what the main page of Ensyma.us looked like back in 2015. It boasts the words “United American Consumer” over the ‘Enter’ key on a computer keyboard. However, the web archive stops in the year 2015 and proceeds to go blank when one searches for current files. 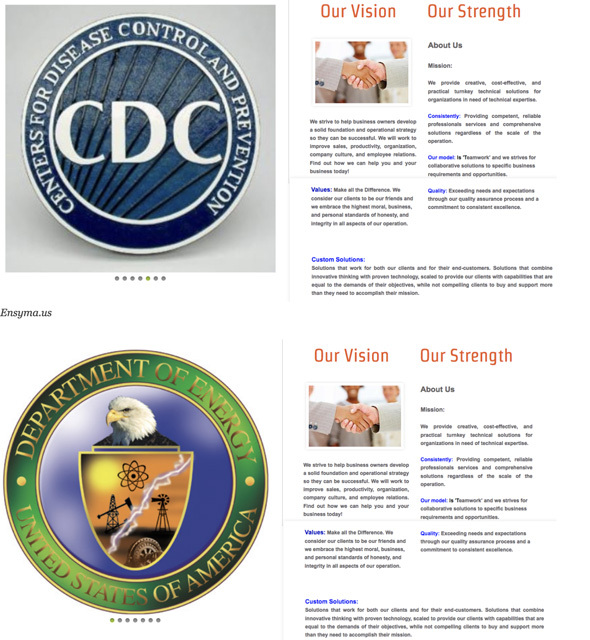 Additionally, on the Internet Archive we can see the Ensyma.us website appears to be affiliated with several government agencies such as the Center For Disease Control and Prevention (CDC), CERN, the U.S. Department of Energy (DoE), as well as Soldier Sensors and Lasers. Withal, it’s also important to note that police found a Department of Defense Conceal Carry License in Bradley’s Jeep. Technical Writer with experience creating reader-friendly documentation, user guides and dynamic presentations for internal and external end-user audiences. I convey complex topics easily by transforming them into plain business language and non-technical documents. I maintain a high level of productivity and I ensure clarity and consistency throughout my writing process. Using the knowledge gained through past work experience, I am able to research, edit and publish raw technical data, revise lengthy procedural guides and craft business workflow diagrams. I rely heavily on my ability to define the target audience and deliver the data in a standardized format. I collaborate with teammates to advance the development of software/hardware product content, user manuals, train the trainer curricula, quick tip guides, and social media posts. Over the years I have supported a number of national and international industries including retail, insurance, information technology, healthcare, transportation and manufacturing all of which required authoring useful information for remote and/or mobile users. When Francho Bradley told police they were "dealing with a virus" as part of a "secret mission," was he spreading the deadly virus on behalf of the CDC as he claims, or were they acting alone?